More than 1,150 food items, including a bag of jelly beans and a maple-leaf-shaped bottle of syrup. An 11-person construction team, plus support people. And a whole lot of love for the community. 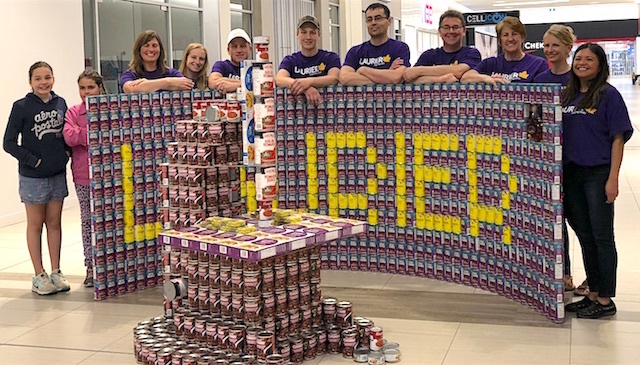 These are the ingredients that went into creating the giant microscope that is the Wilfrid Laurier University Faculty of Science’s “Canstruction” installation at Conestoga Mall in Waterloo. And it’s all in benefit of the Food Bank of Waterloo Region. This is the first year the Faculty of Science has participated in the fundraising event and its entry, Focusing on Science, has already won the judges’ “best use of labels” award. The most important award, however, has yet to be decided. That’s where you come in. The People’s Choice award is based not on the number of votes but rather the amount of money raised. People can donate online or visit Conestoga Mall in person – either way, the campaign ends May 13. Just one dollar provides three meals, while $50 provides 150, according to the Food Bank. The Faculty of Science decided to get involved rather at the last minute but the way people came together is a testament to both Laurier’s technical ingenuity and sense of community, says Ruth MacNeil, the faculty’s senior administrative officer and one of the team members. Ron Daniels, program coordinator for Science Entrepreneurship and the LaunchPad Science Maker Lab, designed the microscope with the help of student and lab assistant Denisa Dica, using the computer-aided design (CAD) software in the Maker Lab. 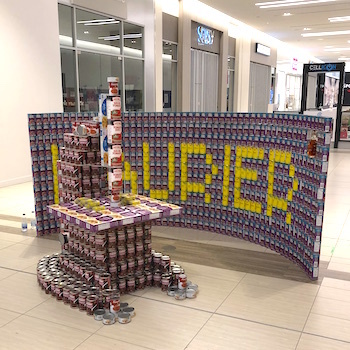 Associate Professor Bruce McKay, the faculty’s associate dean of student services, came up with the idea of adding a curved wall reading “Laurier.” MacNeil scoured grocery stores for cans with labels that would add to the design and coordinated the large purchase. James Emary of Laurier Facilities and Asset Management organized pickup and delivery of the food. Gary Bott, also of Facilities and Asset Management, provided his carpenter’s expertise to the project. Faculty of Science staff member Kelley Putzu helped with the test pre-build on campus. After the partial test build, the team built the structure on May 5, after stores closed. Some of the team members brought their families and Faculty of Science Research Instrumentation Technician Gena Braun also volunteered to join the building team. Besides the many cans, the team used boxes of pasta for the microscope base, jelly beans for the “specimen” and the maple leaf-shaped bottle for the leaf that normally comes after the Laurier name in the logo. Sardine cans became the clips for the specimen slide. The experience was a lot of fun – and got team members thinking about next year, says MacNeil. There are ideas currently under discussion about doing an in-house competition in support of the Laurier student food bank as well as rejoining the Conestoga Mall competition, perhaps with the participation of more students. The People’s Choice award winner will be announced May 15 on the Food Bank of Waterloo Region website and social media accounts.